last week I missed sepia saturday but it was on much on my mind as I mined the family photos at my parents house. the photos today are all images that I brought home with me from that mining expedition. later this month my parents will be celebrating their 59th wedding anniversary. in honor of this event, I thought I would take the next couple weeks and share some photos of my parents before they met. 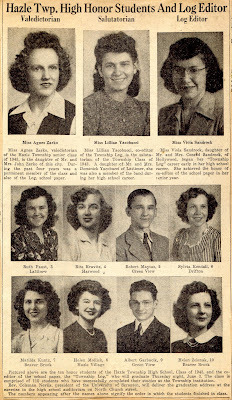 the focus of today's sepia saturday is my mother rita who was born on may 1st 1925.
although my mother had the brains for the university, rita grew up in a culture where it was the norm to go to work right after high school, especially for girls. in fact, it was not until my generation that girls in my family began attending university - although I am not the oldest of the girl cousins, I was the first to matriculate and graduate from university. a few of my younger female cousins followed suit, but attending university didn't become normative until the we get to the children of my generation of cousins - nowadays, I'm happy to report both boys and girls attend university after graduating from high school. right after graduating, my mother started working for geissler knitting mills. however, unlike most of her contemporaries, rita didn't work on the floor of the mills, but rather worked as an assistant to the owner of the mills, mr. geissler. 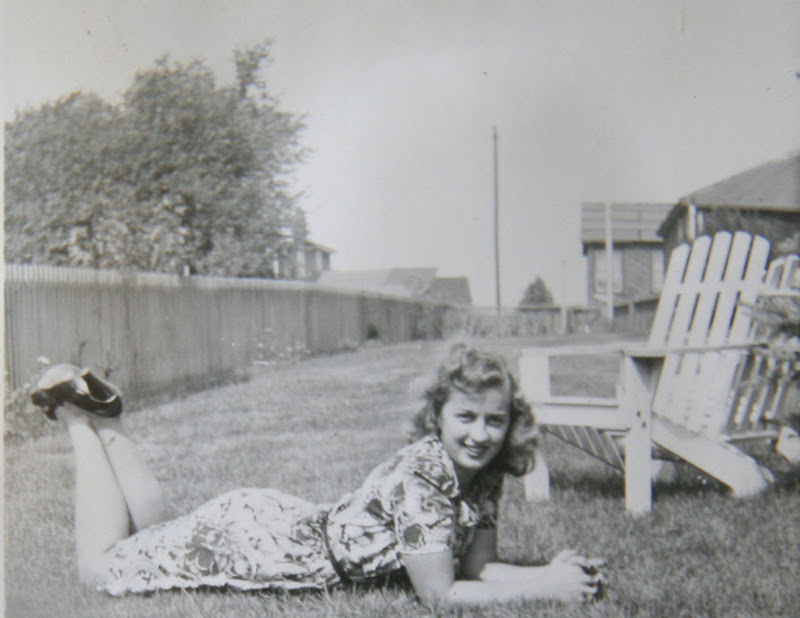 she worked for the company until she married my father in 1951 - but that is another story. since every photo tells a story, I'll just finish up today's post with a few of photos of rita from those years before she met my dad. 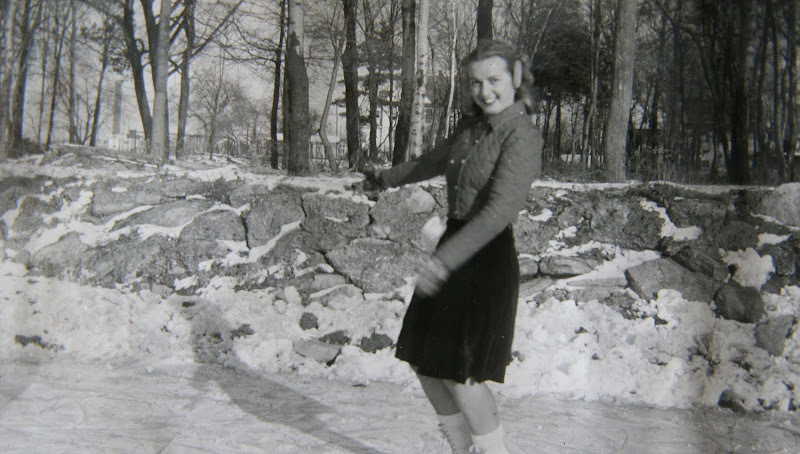 in high school my mother loved ice skating. underneath this photo in my mom's album is the caption guess ???? sonja - hazel park. 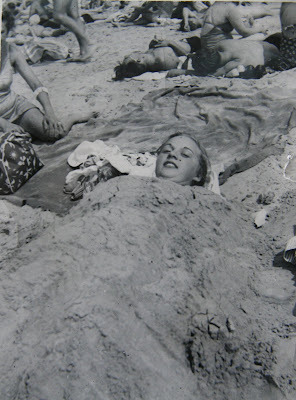 a very popular summertime activity for rita and her friends was to head to atlantic city where they frolicked in the sun and sand. my mother had an impressive collection of swimsuits - however, she stated that this one with the giraffes was by far her favorite. given the do on my mom in this photo, I bet she recently finished up a gig - for some extra cash, my mother was a hair model - you can read about that activity in a post that appeared on the mouse a while ago. 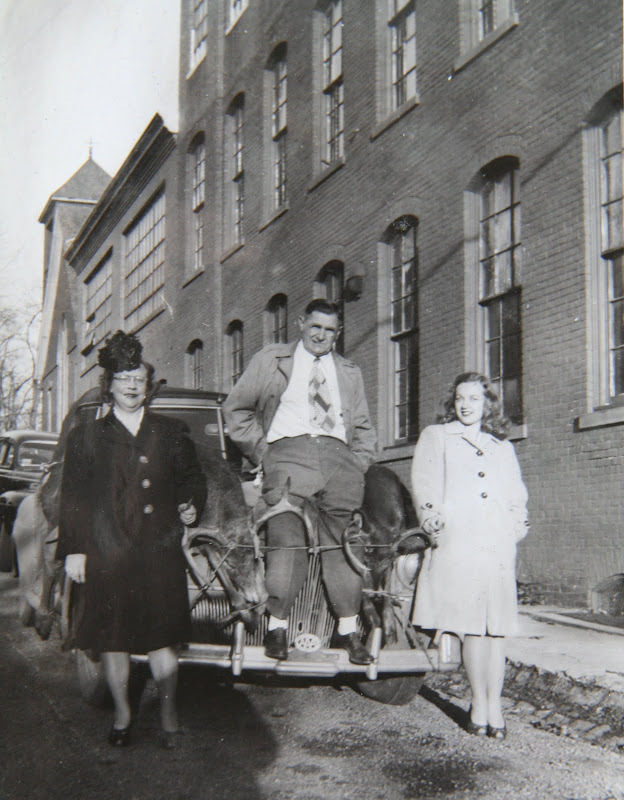 the photo above was taken outside geissler knitting mills - mr. geissler, the owner of the company and my mother's boss, is hamming it up on the hood of his car positioning himself between the bodies of two dead deer. on the left is mrs. geissler, and yes, that is my mother on the right. I wonder if there was some sort of subliminal message to the workers of the mill by coming to work with the bodies of deer splayed on the hood of the boss' car? the beatles classic lovely rita - though my ma wasn't a meter maid she is quite lovely! He looks like a tough boss - I would guess a union-buster. Your mother is gorgeous. Your mother was quite lovely, in all her pictures. The video reminded my wife of her experience as one of the girls screaming at a Beatles concert when they first came to Toronto in the 60's. She still has her portion of the ticket to the event. Interesting that there are only 2 young men in the top 10 of the class. It makes me wonder about the female:male ratio in the class, and how many students (both male anad female) left before graduation to join the work force. Or maybe it was just a very smart group of young women! Your mother is stunning in these photographs. Lovely Rita - very fitting. Obviously, the mill owner recognized your mother's intelligence and didn't want to waste it. Let's hope he wasn't just interested in her beauty. Rita certainly is a beauty. I particularly love the giraffe swimsuit! She sure was pretty. I'll bet Mrs. Geissler worried every day when he left for the office. I wonder what he was like as a boss. He looks pretty scary! Great photos!!! 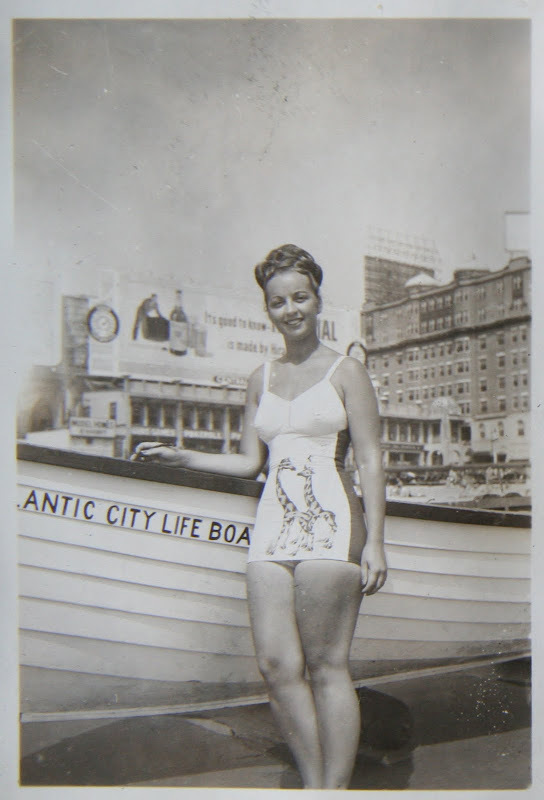 Vintage swimsuits are the best, aren't they? I wish they made them like that today, I find them MUCH sexier than the candyfloss I see on so many young ladies. I'm late visiting (still trying to catch up) but whenever I see your name next on the list of Sepia Saturday participants I always know I am in for a treat. And a treat it was indeed. A perfect example of how photographs can tell a stiry so well.